Ohio is home to approximately 500 native bee species. These diverse bees play important roles as pollinators of agricultural crops and native plants. Mason bees, mining bees, leaf cutting bees and sweat bees are just a few of the most common types of bees seen in gardens and landscapes. Queen bumble bee on a viburnum shrub. Bees are facing many threats, such as lack of forage (flowers for food), pests, pathogens, pesticides, invasive plants, climate change and lack of suitable nesting sites. Bees are considered the most important pollinators because they are uniquely adapted to gather and transport pollen. Bees rely on flowers for food to feed their young, so they actively seek out and visit flowers. Bees’ fuzzy bodies and branched hairs help female bees collect pollen into special structures, such as pollen baskets on the hind legs or long hairs on the thorax or abdomen. Bees also forage for food close to their nesting sites, a practice called central place foraging. Bees visit one or only a few flowering species during each foraging trip, even when other flowers are available. This behavior, called flower fidelity or flower constancy, makes bees especially reliable couriers to move pollen to receptive flowers of the same species. Native bees can be divided into three groups: social bees (bumble bees), solitary ground-nesting bees (such as mining bees) and solitary cavity-nesting bees (including mason bees and leaf cutting bees). Honey bees are social bees, but they are native to Europe and Asia, not North America. Social bumble bee on bee balm. 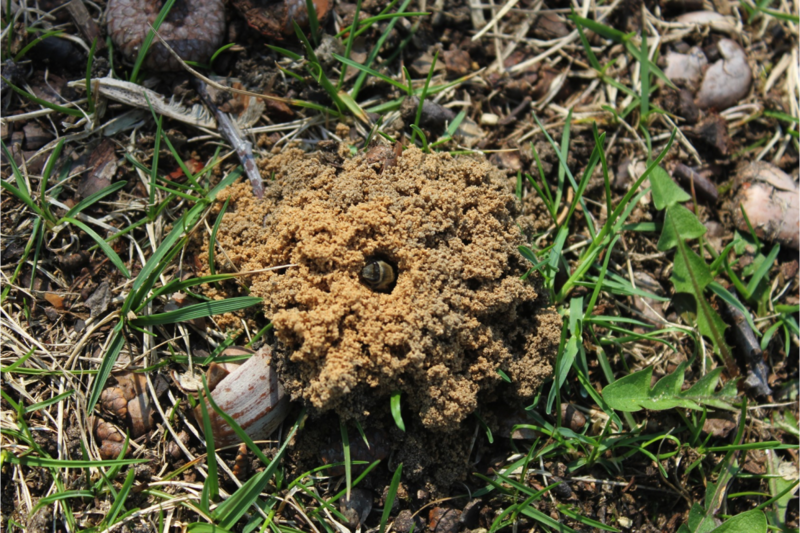 Ground-nesting bee kicked sand out of her tunnel. Leaf cutting bee. Gardeners can play an important role in bee conservation by providing plants and nesting sites, and by adapting gardening practices to protect bees and other pollinators. A mining bee on shrub dogwood. 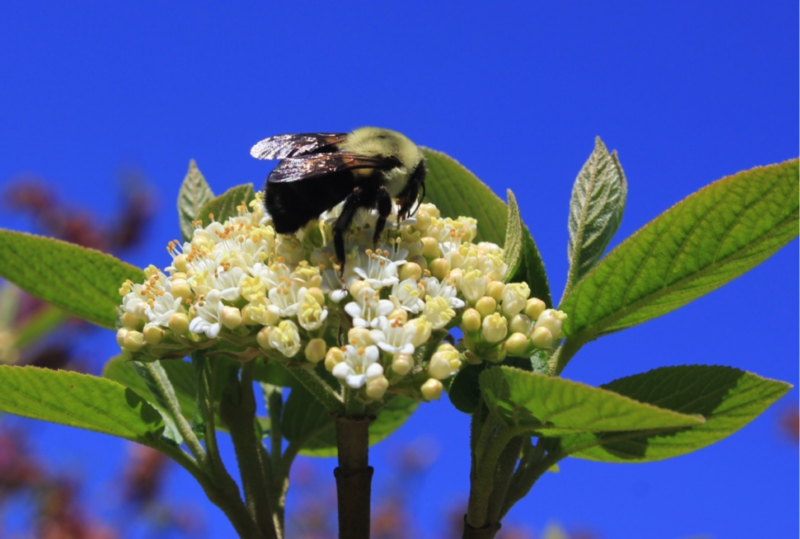 Trees, shrubs and herbaceous plants can provide food and nesting habitat for native bees. Select an assortment of plants that bloom from early spring through fall. An abundance of different flower shapes, sizes and colors will appeal to a variety of bees. Grouping plants together in sunny locations helps bees find and feed on desirable flowers while expending less energy in the search for plants. Weeds—including clover, dandelion and goldenrod—provide critical food resources for bees. 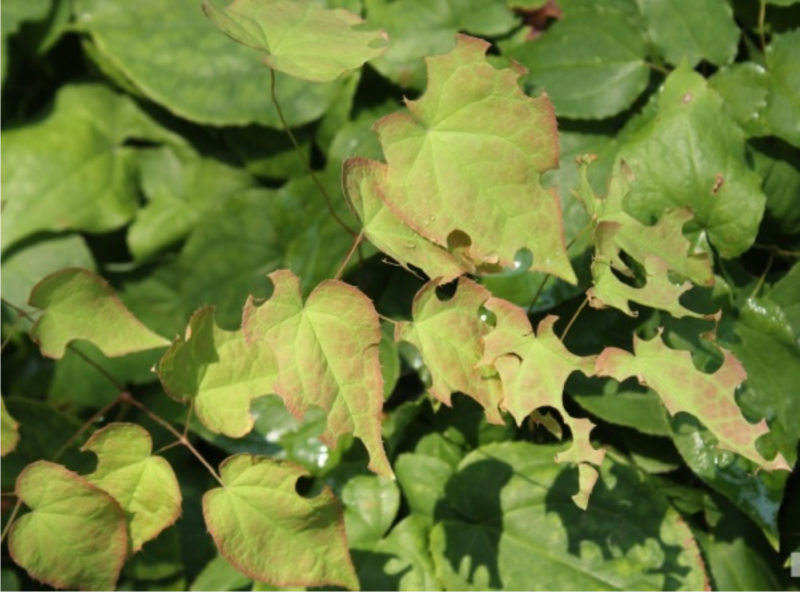 Consider tolerating these weeds when appropriate. By observing flowers in private and public gardens and taking note of flower visitors, gardeners can learn which plants are most attractive to bees. If space allows, consider planting a small meadow or prairie patch full of native wildflowers to provide food from spring through fall. Evidence that a leaf cutting bee collected leaf discs. Brush piles, stacked firewood, fallen logs and bare soil all provide critical nesting habitat for bees. Purchased or constructed “bee hotels” can also be used, but they must be regularly cleaned and rotated out of use to prevent disease buildup. Provide a water source, such as a shallow dish or a birdbath filled with stones or sticks, to allow visitors to land without drowning. In gardens and conservation areas, avoid the use of pesticides on plants visited by bees. Use an integrated pest management (IPM) approach to reduce pest pressure. All photos by Denise Ellsworth.